Jin Lei, the Legendary Honorbound Caster is now available, and he's brought word of a ferocious new boss! Similar to the Raven Boss Invasion, there is an extremely powerful boss for you and your guild to take down together, but there's a new twist this time: They have a minion! Defeating the minion will earn you 25 courage that you can use to face the boss. The minion is an enemy that you must face and defeat alone, and they will also scale in difficulty similar to the boss itself. The minion's dungeon is operating on a cooldown timer, but the boss can be faced anytime you have courage, even if the minion's dungeon is still locked. If you defeat the boss, the minion's cooldown will be reset for everyone in your guild. Neither event dungeon requires any stamina. There are three leaderboards for this event. The first two are all about who can defeat the minion the largest number of times, and the third focuses on how much damage your guild has dealt to the boss (similar to the Raven Invasion). You can monitor your guild's progress on the event dungeon selection screen, so you can see how close you are to defeating the boss even when your not in the dungeon. Jin Lei has a history with this boss, giving him a significant advantage in battle! If you have him in your collection, you'll probably want to bring him along! UNLIKE the Raven Boss Invasion, you do NOT need to be in a guild at the start of the event, and you are allowed to switch guilds during the event. HOWEVER, if you leave your guild any contribution you have made to that guild's leaderboard standing will be lost, and that progress will not be restored if you rejoin the same guild or any other guild. Abandoning friends comes at a steep price, so act wisely! In addition, we've released a new type of rune: Limited Runes. These runes are capable of having higher stats than other runes, but they can only be equipped to certain heroes. The first limited rune we have is an Honorbound Rune, which naturally can only be equipped to Honorbound heroes. In addition to the stats it provides, it will also give a hero equipped with one a passive that lets them deal double damage to the Minion and Boss during this event! Nice job on giving everyone more options to play and punishing players who quit/transfer guilds (unfortunately the guild gets punished too) Too bad it's still a pay to win event with the same steep gem refresh cost as the Craw event. Just another let down, no surprise there. 25,000 tickets for 5 Jin Lei tokens? Isn’t that...er...a bit much? Why’d it go from around 10,000 (correct if that amount is wrong) for 5 Craw Tokens to 25,00 for Jin Lei?! I don’t even have that offer. @Joel The description says that the minion cooldown timed will reset each time the boss is killed, but that is not happening. @Joel there is a bug where the minion dungeon is not unlocking after a boss kill. Has persisted through 2 boss deaths. Edit: Opps, sorry, didn't see someone had already brought it up. I posted something in the bugs section too. Got a letter saying we can only get him through the loot pass? That's ridiculous. Can't you, I don't know, stick him in the VIP Portal for old times' sake? You're making it really hard to stay, I want you to know that. Better, maybe, but "better" is relative. One step forward is technically better, but not so much when you took 10 steps back beforehand. Some panda tokens for top 5-10 would be nice.. as opposed to a rune anyone can buy in the rune shop and some gems. Not bad thus far. Minion dungeon failing to unlock after a boss kill is a negative, though. Until someone finds the official event exploit, I'll give it a 5 out of 10. What I hate most about this event is that I spent tickets five times for Aether. Not bad thus far. Minion dungeon failing to unlock after a boss kill is a negative, though. I've had it not unlock twice now. It's very frustrating and limiting when it shouldn't be. Edit - Make that 3 times we just pushed the boss up another level and it still didn't unlock. The unlock MAY only be for the player that did the kill. If this is as intended, then the wording is misleading. Nothing new there. Otherwise it is a bug that brings down the event. Too bad. 25k for 5 panda tokens??? ehhhhh. I do like the youtube vid you guys made of him though. I think you should do that for every new hero that comes out. Its helpful to see what the character can do. Borning event, with very little new hero tokens. In my event shop there are no panda tokens. @Joel is this right or are there supposed to be tokens in the event shop for tickets? Sounds like other people have it and I don't. 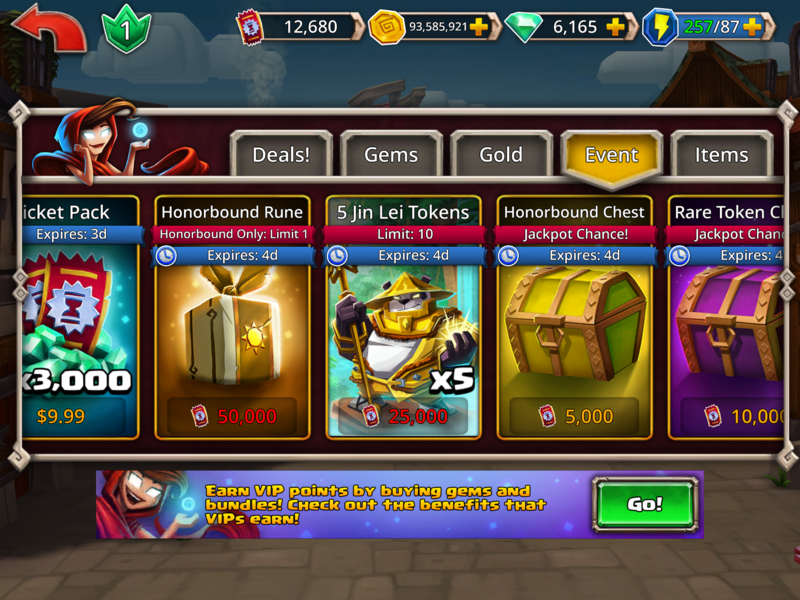 @Joel I just looked at a friend of mines game, in the event shop between the runes and the jackpot chests he has 5 tokens for 25K tickets limit 10. I don't have this. I also have almost 25K tickets and nothing else in the shop I want to spend tickets on. Is this going to be fixed so we can all spend the same on the same things? I have the tokens in my shop, but even if I unlock him I will not have the evos to ascend him. Maybe that is how they are determining who gets these tokens in their shop. Did the players with tokens in the shop purchase the Loot Pass ? Are the players under MAX level ? If you defeat the boss the cooldown timer is reset for everyone in your guild. What a joke. I’ve watched the boss stage go from 27 to 31 without my minion dungeon unlocking. Takes 4 hours. Other members of my guild have no problem with it resetting. I’m sure they’ll get this fixed, by Monday. Can’t wait to see the screwups for the Christmas event. I purchased the loot pass. I am max level. I have no tokens in my shop. YOur own guildmate won't even share with the guild?? LOL. Ouch.